AMC announced today that “Breaking Bad,” the Emmy Award-winning and critically lauded drama series from acclaimed writer/producer/director Vince Gilligan has been renewed for a 16 episode order that will conclude the series. Production on all episodes of the final order will commence in early 2012. The roll-out of the episodes and premiere date schedule has yet to be determined by the network. The announcement was made by Charlie Collier, president of AMC. 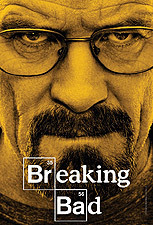 “Breaking Bad’s” fourth season premiered on Sunday, July 18th to the highest ratings ever for the series. “From the day we heard Vince Gilligan’s completely original vision for ‘Breaking Bad,’ it has been a complete joy to be involved with this show. Watching this story evolve into the complex, compelling, and intense roller coaster ride that it has become has been an incredible creative experience for everyone at AMC. Beyond that, working with Vince, his brilliant cast and crew, and our wonderful partners at Sony has been remarkable in every way. While it is sad to even contemplate the end of this series, we are so happy to have had the chance to go on this ride, and truly look forward to presenting the rest of this amazing story,” said Collier. “Breaking Bad” stars Emmy Award-winner Bryan Cranston as Walter White; Emmy Award-winner Aaron Paul as Jesse Pinkman; Anna Gunn as Skyler White; Dean Norris as Hank Schrader; Betsy Brandt as Marie Schrader; RJ Mitte as Walter, Jr; Bob Odenkirk as Saul Goodman; Giancarlo Esposito as Gus Fring; and Jonathan Banks as Mike. Breaking Bad is filmed on location in Albuquerque, NM.